Over the last year the encounters between my dog and “my” coyotes have escalated into confrontations. A year ago I could unleash my sixty pound dog in their field and successfully manage their infrequent interactions. I’ve come to understand that my past success was influenced by chance and happenstance to a greater degree than I previously thought. Today I consider my entering their field as potentially unsafe and provocative. In contrast, other people use that field at times and have told me they have not seen coyotes there. Young boys use a part of the field for bicycling, having built earthworks for that purpose. Transients at times sleep there. Groundskeepers make their appointed rounds. Teenagers party. Towards these other field users, the coyotes have remained a “ghost species”, perhaps because they don’t bring dogs with them. My dog and I have caused the coyotes to single us out for increasingly confrontational treatment. It took a year for those changes to develop, a testament to the coyotes’ natural tendency to avoid people. By chance and happenstance I mean factors that influence coyote behavior. At root their behavior is about food and reproduction. Coyotes live mostly in family groups. Consequently, if you see one coyote there is a good chance there is at least one more present nearby. It doesn’t seem likely that one coyote and an equally or greater sized unleashed dog will seriously injure each other. My opinion is that mature breeding coyote pairs together are smarter and stronger than one dog of their size or larger and that coyotes don’t play by the rules that a typical pet dog expects. The encounters between a larger unleashed dog and such pairs seem to me to be advantaged to the coyotes. The proximity of a human and the degree of human control exercised over the dog become critical to the outcome of such an encounter. An unleashed larger dog appears to a coyote as an interloper, and intruder. Coyotes are known to be intolerant of interloper coyotes. Coyotes will defend their food sources and their young. Their options in so doing are legion and their choice of tactics is perhaps situational. My situation is that my dog foraged, he did not simply walk through the area and/or chase my coyotes. Also, my dog interacted with a mated pair. 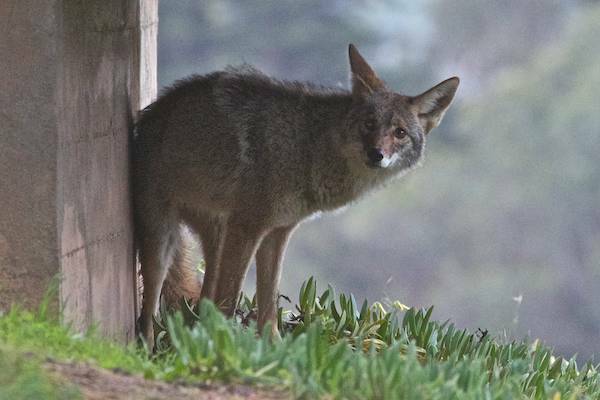 My observations of my coyotes and my interloper dog took place over the last year or so. The contact with the coyotes began with them simply showing themselves. They seemed to be saying, hey, you’ve smelled me and my markings, why are you still here? After a time of being in view, they would withdraw into the brush. At some point later Dad would attempt to sneak up behind my dog, presumably to deliver a nip to his haunches, nips I could prevent by yelling. As time passed and I ignored these messages, Dad escalated to warning bark sessions after which he would return to the brush. Barking sessions were later replaced by more aggressive displays of marking, scraping and mock charging followed by partial withdrawals where he remained in full view. If we didn’t leave, he would begin those aggressive displays again. Later, to those types of aggressive displays, Dad at times seemed purposed to separate me from my dog where I read his intent as to engage my dog in combat. Mom recently temporarily separated me from my dog although we were on opposites sides of a chain link fence. These behaviors developed over about a year, and about a month ago, Mom also began mock charges, marking and scraping without retreating from view. I should mention that the zone of intolerance increased beyond their field and into other areas where my dog and I had never had problems with them. My read of my dog is that he would not visit those coyotes of his own accord and that he has felt that way for some time. Also, much of the time when we walk along the river bank or go to the bridge, we don’t see any coyotes. When we do, many times my coyotes don’t behave aggressively. I can’t predict when they will or when they won’t. When I do see them, it is for an insignificant fraction of their day and I never know what kind of day they had. Several years ago in a different area, at dusk, two coyotes followed my dog and me as we were leaving. On the crest of a hill, one of the coyotes ran out in view of my dog while the other remained behind crouching. My dog stupidly chased the moving coyote down the hill out of my sight. The crouching coyote did not follow my dog, perhaps because I was present. Perhaps the coyotes were practicing, but clearly my dog was at risk of being defeated in a frontal and rear attack. I hadn’t visited that other area very often, yet those other coyotes engaged my dog at a level it has taken a year for my usual coyotes to approach. Once, in that other area, my dog was off leash and out of my view. I called him and he didn’t come. I began to look for him and soon saw him running full speed towards the exit which is located about a mile from where we were. I called him, he momentarily paused, missed one step in his galloping gate and looked me in the eye. His look and body language said to me, “Forget it, I’m outta here buddy!” It took me a while to catch up to him near the exit. I believe he was responding to some wildness directed towards him by a coyote, again, one of my first visits to that other area. Here again I am speaking to the unpredictability of coyote behavior, the reason the experts advise us, upon seeing a coyote, to go the other way. We can choose to do so. An unleashed dog may decide to chase the coyote and the outcome may or may not be consequential to the chasing dog. Part of the unpredictability of coyote behavior could be attributable to the fact that the circumstances in which coyotes find themselves change over time. Food may be plentiful one year and scarce the next. A female may lack a mate one year and acquire one the next. One year there may be no puppies and the next there may be several that survive for months or longer. I have no idea why the coyote I call Mom recently became aggressive when for the longest time she was timid and obsequious. I want to reiterate that the behaviors of escalating aggression I observed over a year were behaviors that I elicited by ignoring the messages the coyotes were giving me. My behaviors caused the increasingly aggressive behaviors I observed. From the point of view of the coyotes, my behavior was that of a perpetual repeat offender. I continually brought my dog, whom they perceive as an intruding competitor, into their home. I had decided to give my 60 pound dog a little space with coyotes in order to find out for myself what would happen. I don’t like what happened. My behavior was to repeatedly intrude into their home range and seek contact and take pictures. My unwise dog used the space I gave him to seek food and to disturb the coyote family. The coyotes’ home range contains their children and their food, the two things coyotes care most about. They responded accordingly. After all, coyote behavior is rooted in food and reproduction. I’ve wondered, considering how little territory my coyotes occupy, how it was that rabbits were always present. Why weren’t the rabbits depleted and why hadn’t the coyotes moved on? One reason is rabbits reproduce rapidly. Another is that other rabbits nearby come in and take over the space formerly occupied by rabbits that the coyotes ate. The same kind of habitat seeking applies to coyotes. Removal or extermination creates empty habitat for other coyotes to find and occupy. The idea that “something must be done” about coyotes is simply an idea that is obsolete. Coyote survival in urban and suburban areas doesn’t depend at all on how many are removed or killed. Their ability to find and use habitat in urban and suburban areas depends on how we behave towards and think about coyotes. 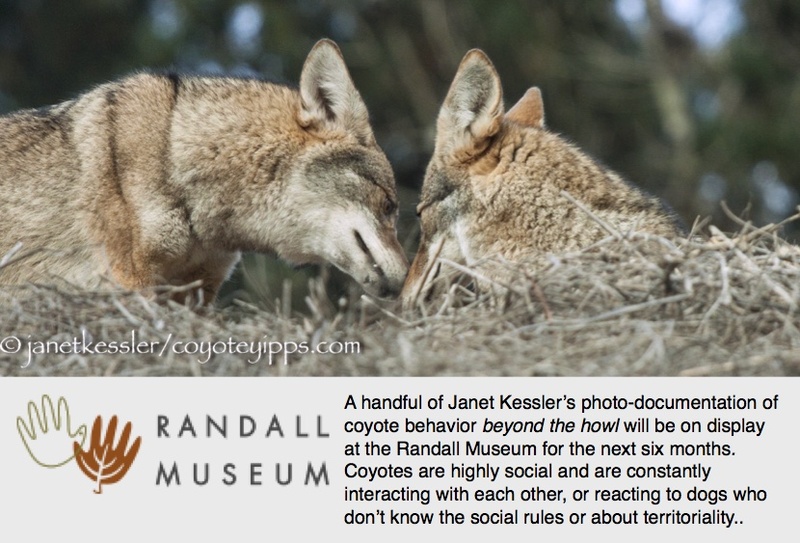 Understanding the nature of coyotes helps us to manage our lives in ways that minimize unwanted contacts with them. Coyote presence requires us to change a little. Crows and ravens are quite similar and quite different. Both are extremely intelligent birds — they have been known to use tools! Crows tend to like urban settings whereas ravens prefer more natural settings. Ravens weigh about four times more than crows and have a wingspan of almost 4 feet versus 2.5 for the crow. Crows caw whereas ravens tend to croak! Tail feathers in flight are more diamond-shaped for a raven, with a slight point, whereas for a crow the configuration of the tail feathers is more of a fan-shape: more rounded or even flat at the tip of the tail. The beaks of ravens are much more robust than that of crows. And, ravens have more vocal ability: a friend today told me that all was quiet as he was taking photos of ravens, and then the ravens began mimicking the click of his camera!! Both are raptors, which means they do eat prey among other things. They eat rodents, carrion, berries, refuse. They are scavengers. These birds will sometimes work as a team: two are more effective than one. So, for instance, I often see crows pursuing and attacking a red-tail hawk. A red-tail hawk is a larger bird, but the crows work in pairs or even more — their advantage in such a situation is that there are more of them. I don’t think a red-tail has ever really been “hurt” by these attacks. Rather, the crows are driving the hawks away from their main haunts — they are protecting their territorial hunting areas from competition. Maybe they are also protecting their young ones and eggs. The birds depicted on this posting are ravens. This is a common scenario. Ravens and crows treat coyotes in the same manner and for the same reasons. Coyotes (the dominant alpha ones) treat dogs in the same manner and for the same reasons. Humans treat coyotes and other humans (think of the immigration issue) in the same manner — and that is how it goes. However, I’ve also read about a symbiotic relationship between crows and coyotes. I’ve seen ravens and coyotes together in various of our parks now. Competition between ravens and coyotes can be understood because they eat the same stuff: rodents, carrion, berries, refuse. They are both scavengers. Yet, I’ve read where they can work together, too. Ravens know how and when to take advantage of other animals to help them bum a meal they couldn’t get on their own. They might wait for a coyote to catch a larger rodent, say a skunk, which they will finish off after the coyote has gone. In Yellowstone, bison that have not survived the severe winter attract the coyotes, whose teeth and jaws can rip open the tough, frozen hides — making the meat accessible to watchful ravens. Ravens also have followed wild wolf packs to a kill; even flying ahead of the wolves to lead them to prey! Over the past few weeks I’ve become aware of ravens croaking loudly for 20 minutes or so. This has always been from a particular grove of several trees. I wondered what kind of “party” they might be having!! Several times I walked over, but by then the croaking had ceased. Then today, I finally saw why these ravens were carrying on so. They were attempting to drive out a little coyote who was hunting in their area — the same as I’ve seen them drive out the red-tail hawks. The ravens were following the coyote and croaking loudly. The coyote kept looking up at them and stayed close to low-lying overhead branches for protection. At one point this coyote approached an open area away from the raven area. This area bordered on a path, and when people passed by, the coyote re-entered the bosque again. Coyotes are very edgy around people and dogs and most will avoid them if at all possible. I’ve added photos above of the little coyote hiding behind a tree, hiding behind some brush, running off from various dog and human situations. And there is a photo of a young coyote hunting — this is, of course, why they are out in the first place. This is the first day I have ever seen a coyote actually rip open a garbage bag. The coyote was hungry and that is why it was out.